This entry was posted	on Friday, March 18th, 2011 at 11:47 AM	and is filed under News. You can follow any responses to this entry through the RSS 2.0 feed. You can leave a response, or trackback from your own site. Seems like someone is confused. I am referring to Nvidia trying to overcome the problems that the Radeon 6990 (an AMD Product) has. Because of the sheer power requirements and the high temperatures, the 6990 has a very loud fan. This is because AMD put two cards together. 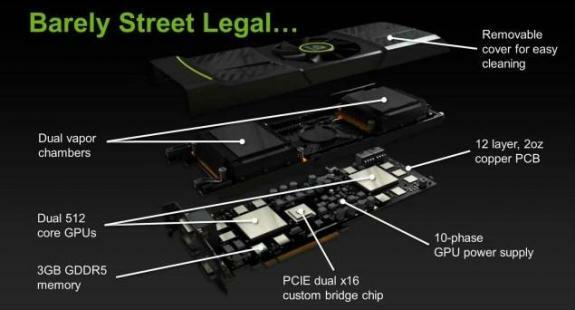 Because Nvidia is doing the same thing, they will have to overcome the same problem. AMD also had issues in their earlier drivers that hampered performance for their 6990. As a result they release beta drivers to alleviate the issues. If Nvidia is rushing to get their product out of the door (which I believe they are to a slightly lesser degree), then there will be some temporary driver issues as well. Gumby is referring to the fact that you keep saying 5990 when you really mean 6990.